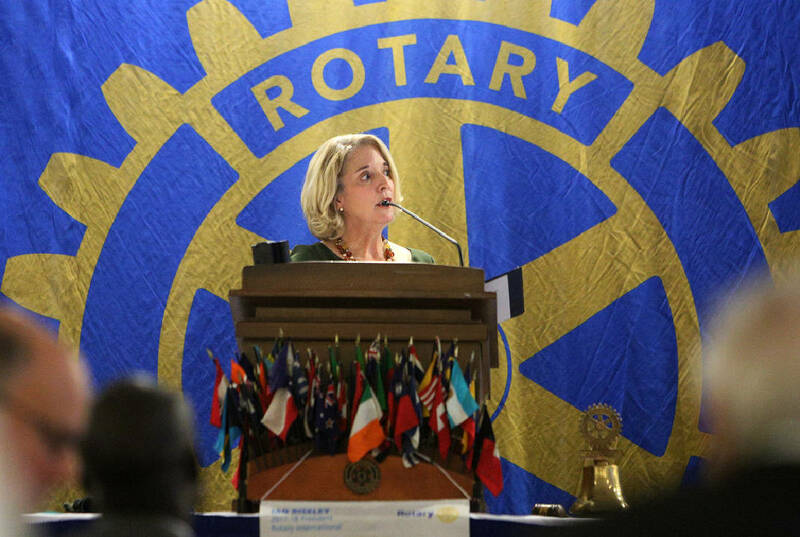 Chancellor Flora Tydings, Tennessee Board of Regents, speaks about the Tennessee Promise at the Rotary Club of Chattanooga at the Chattanooga Convention Center Thursday, Nov. 2, 2017, in Chattanooga, Tenn. Tennessee Promise provides Ҭast dollarsӠscholarships to high school graduates wanting to attend two-year state community colleges or colleges of applied technology. The scholarship increased the number of first-time, full-time students attending college. The first cohort of Tennessee Promise students has had a success rate of 56.2 percent, compared to the national average of just 17 percent, according to Tydings. The first cohort of Tennessee Promise students has had a success rate of 56.2 percent, compared to the national average of just 17 percent, Flora Tydings, chancellor of the Tennessee Board of Regents, told the Rotary Club of Chattanooga Thursday. Tennessee Promise provides "last dollars" scholarships to high school graduates wanting to attend two-year state community colleges or colleges of applied technology. The scholarship increased the number of first-time, full-time students attending college. It also increased the state's Free Application for Federal Student Aid filing rate, making it the highest in the nation, Tydings told Rotarians. Tennessee's FAFSA filing rate increased from 60 percent in 2014 to 73.5 percent this year. Tydings said the average ACT score for the 13,287 students in the first cohort, starting college in 2015, was between 17 and 18, meaning those students would not have been accepted at a four-year university. "So what we found is not only did this increase the numbers that were coming in, but it truly took those students who would not have been able to go to the university, and they are now in college," Tydings said. "They are doing very well." Chattanooga State Community College President Rebecca Ashford said campus resources and retention initiatives began to align for the "greatest success" of Tennessee Promise students. "Today, we continue our focus on completion and student success, and the greatest impact of TN Promise is seeing our students graduate and achieve their dreams," she said in an email. In addition to young people, the state also is aiming to help more working-age adults earn a degree through the Tennessee Reconnect program. The program targets the more than 900,000 working-age adults statewide who have some college credit but did not earn a degree, which is 25 percent of adults in Hamilton County. Reconnect leverages lottery money to provide last-dollar scholarships for people to attend any eligible institution offering an associate's degree. For fall 2018, Tydings said, the board of regents has established Reconnect teams at all 40 colleges to study how to look at the adult student differently. "Adult students come with a different set of issues," Tydings said, noting that many have jobs, families and other commitments. "But they are trying to better where they are in their career trajectory." Though more students are enrolling in college thanks to initiatives such as Tennessee Promise and Tennessee Reconnect, only 15 of Tennessee's 95 counties have a college- going rate above the national average at 66 percent, Tydings said. Hamilton County's rate is at 62.6 percent. Tennessee Promise and Tennessee Reconnect are both key pieces to Gov. Bill Haslam's "Drive to 55" initiative, which aims to boost the rate of college graduates in Tennessee from about 32 to 55 percent by 2025. Tydings said that so far since 2013, the target for credentials has been exceeded. "We feel like we will be at the Drive to 55 success rate by 2025," Tydings said, adding the increase in student success would mean an added $9.33 billion in annual income going back into the state through taxes. "Without question, a huge impact of TN Promise and TN Reconnect is to improve the quality of life for our local residents while preparing to meet the needs of business and industry," Ashford said.